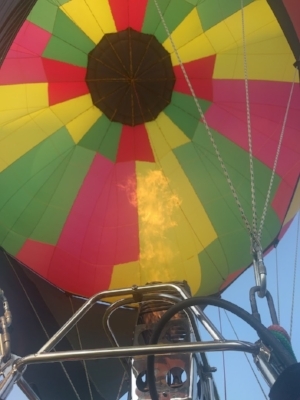 Two summers ago, on Joseph and I's third date, he took me to the annual hot air balloon rally in town. For years now, he's helped out on a balloon crew, and I got to hop right alongside the crew (and hop in the balloon basket!) Every year since then, we mark off our calendar for the rally. I mean, high heights and fire? Joseph and I couldn't ask for a more perfect hobby! This year, we went to the crew training so we could be extra prepared . . . and so I could actually know what I was doing. It was a great experience! Check out this view from the inside of the balloon we set up! This past week has not been a very healthy week for the Langr fam. I haven't had nearly so many lightheaded spells, but Joseph came down with, well we're not quite sure what it was. After a quick trip to the doctor to make sure it wasn't meningitis (aint nobody got time for that), he was sent home to rest up, drink lots of liquids and take some pain killers. He didn't want to give anyone at work whatever it was, so he worked from home for a couple of days. It was weird to have both of us working from home, but I wasn't complaining! Well, when it rains it pours. On our way to Topeka this week, my car continued to make a funky sound that we had heard for a few days. Joseph glanced in the rear view mirror as we made our way along the highway and noticed that it looked like fluid was draining out of our car. Then, all of the sudden the car sounded much worse. So we pulled into a very conveniently close rest stop (thank you, Jesus!) and got out to check what had gone wrong. It turned out that the 'fluid' we thought was dripping onto the highway behind us was actually the tire itself, melting away. We must have drive over a screw or nail because our tire had bitten the dust. Thankfully, I married a man who knows how to change a tire - because I had no idea what I was doing. With the help of a kind rest stop worker who lent us her four-way tool, we got a spare on and proceeded to turn around and get that sick car home. Our little spare tire could only take speeds of 50 miles an hour, which delighted everyone else around us on the highway. So we decided to avoid the highway and take the scenic route home. It took us much longer to get home, but it was fun to drive through little towns that we usually take the highway around. Since that fiasco, Joseph was able to take the car in and get a new tire put on. So it all worked out! A local gym opened not too long ago with the tagline "No judgement. No stress. No boys". It's a women's only gym that offers a ton of great classes - and they're not too far of a drive from our apartment! This week, they're running a fitness study so that prospective members can try out the gym for three weeks and experience classes, one-on-one training, and all the gym has to offer! I'm excited to try them out over the next few weeks! Although I probably won't be doing hot yoga. . . a hot room and my fainting spells are probably not a great combo. But everything else? Bring it on. I brought snacks to Bible study this week, and wanted to take the chance to try out a new recipe I'd never tried before - doughnut muffins with a vanilla pastry cream. They turned out great! And the best part? I had some leftovers that have made a great breakfast pastry alongside my morning coffee. And my afternoon coffee. But don't worry, I'm headed to the gym. 6. Check out the giveaways going on the blog! There are currently two giveaways on the blog that you can enter! The first is a 8" by 10" print which depicts the Blessed Mother's fiat! It has a great graphic style and some gorgeous, intense colors. The giveaway is part of the Marian Virtue series put together by Bethany from Strengthen My Heart. You can enter the giveaway here, then head over to Strengthen My Heart to learn more about the series! The second giveaway is a book from the Sister Marie series by Christine Henderson! Christine is a fellow Kansas City blogger and mother to six kids. She's written the Sister Marie series to help the stories of the saints come alive for kids! If you have littles in your life who would love to learn more about the saints, Christine is giving away a copy of her book, Saint Philomena, help! on the blog. You can enter the giveaway here. Wilson explored the living room yesterday while Joseph and I worked in the living room. After re-energizing with a celery stick, he was hopping all over the place! He couldn't seem to figure out why I was working in a different place than I normally sit during the day, and kept coming over to check it out. I took a quick little video of his adventures - enjoy!